In2011, the infrared detectors of NASA's Spitzer Space Telescope has detected indications that one or more comets was torn to shreds after colliding with a rocky body in an alien solar system in a manner similar to what happened to our own solar system several billion years ago during a period known as the "Late Heavy Bombardment," which may have brought water and other life-forming ingredients to Earth. Spitzer spotted a band of dust around a nearby bright star in the northern sky called Eta Corvi that strongly matches the contents of an obliterated giant comet. This dust is located close enough to Eta Corvi that Earth-like worlds could exist, suggesting a collision took place between a planet and one or more comets. 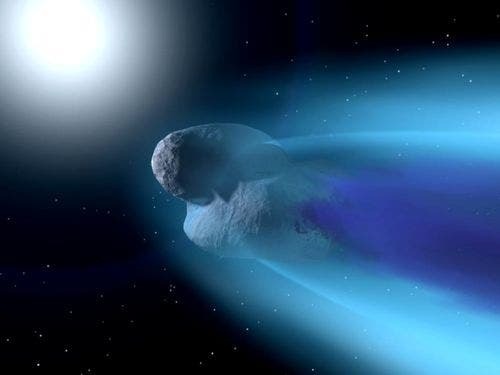 The Eta Corvi system is approximately one billion years old, which researchers think is about the right age for such a hailstorm. 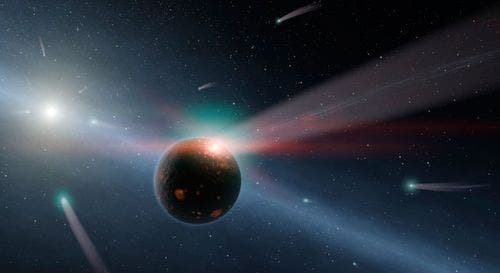 "We believe we have direct evidence for an ongoing Late Heavy Bombardment in the nearby star system Eta Corvi, occurring about the same time as in our solar system," said Carey Lisse, senior research scientist at the Johns Hopkins University Applied Physics Laboratory. The NASA artist's image below illustrates a storm of comets around Eta Corvi.